My girls never cease to amaze me with how much they’ve already achieved in their little lives. They may not read so well but why would they, no one really spoke to them for their first few years of life so if they didn’t know what the words sounded like, how could they possibly read them. Instead they’ve had to catch up on all they’ve missed out on, its been a massive struggle and they’ve never given up or complained, now that’s determination. They may not be able to add numbers together very well but they learnt to count the number of footsteps they’d hear before someone reached the top of the stairs or the number of arguments that were safe to hear before they had to go and hide and all before most children learnt to count to 3, that’s pretty clever in my book. They may not be very tall but that’s because their body’s were so busy developing their senses for survival in those early years that there wasn’t enough energy left to grow. Their other senses are far more advanced than most other children, they can smell the seasons before we see them. They may not always hear everything you say but that’s because they’re too busy listening out for signs of danger. They are great at hearing other peoples conversations and sensing danger, they have a brilliant understanding of road safety and house hold dangers. They may not have great co-ordination but their sense of direction is amazing, they would know how to find their way home from most of the places we visit. They may not have favourite toys but that’s because they have a new found appreciation for their surroundings. The green grass and the blue sky, the smell of spring, the sound of the birds, all the things their senses were too busy to notice before, the things most children take for granted. They may not always hold their knife and fork properly but then, they’ve only used them for a short time. They can however dress themselves, fold or hang their own clothes up, and fasten their own coats, shoes and seat belts, things they can be proud of in my opinion. They may demand our attention and our love but they never complain about having lost their entire birth family, school friends, home, or toys. They would never look at another child or person with judgmental eyes, or gloat at someone’s downfalls, they love everyone unconditionally. A beautiful trait that even some adults still lack. There are lots of things that my girls can’t do that children their age can, but there are more things that they can do that many children can’t and given their past I think they have even more to be proud of, they’ve had to over come such a lot and yet still they’ve accomplished so much. My girls have all suffered unthinkable loss’s and trauma in their lives, yet still, somehow they find the strength to smile every day. I’m not sure I could achieve a smile if I’d witnessed such awful things and then lost everything I’d ever known, and I know I wouldn’t have the inner strength to show any interest in sleeping or eating, never mind playing or learning, could you? I’m so very proud of the strength and determination my girls show me each and every day, they are the biggest achievers I know! So my big girl has trouble sleeping. She has done since she came to us (probably before to but we’ll never know). she used to get up 6/7 times a night, after lots of months of perseverance, she no longer gets up in the night. She doesn’t sleep though either. She fights sleep to the death and will do all she can to keep herself awake. She used to take on average 2.5 hours to fall asleep. Meaning if she went to bed at 8pm it would be gone 10pm before she went to sleep. Again many many many months of perseverance and we have managed to reduce this to 1.5hours, 1 hour is the minimum and very rare. I’ve been monitoring her sleep patterns now for over a year, im confident that if she closed her eyes and lay perfectly still for 15 minutes she would fall asleep. The other issue is that once she finally does fall asleep she is so hyper vigilant that she wakes every hour, literally, throughout the night. Sometimes for only a few seconds, sometimes for up to 10/15 minutes, but all meaning she is getting no REM sleep or very little if any. She’s so tired, she has dark circles under her eyes, she looks pale some days, her muscles ache, she has no concentration, her attention seeking behaviors are accentuated and she overall just struggles with life more when she’s tired. Because of the above we’ve tried everything we can to help her sleep. Low lighting, soft music, audio stories, quiet time before bed, early nights, late nights, an eye mask, blank out blinds the list goes on and all to no avail. She now goes to bed on school nights at around 6pm, just so we can have her asleep for before 8pm. We’ve reluctantly resorted to sedative infused children’s cold medicines once every few weeks in the hope that she will catch up a little. Her sleep problems have such a major impact on hers and our lives. I’m reluctant to let her have late nights as she can’t catch up on sleep. She wakes between 5am and 6.30am and once she wakes she is unable to go back to sleep. If she slept through the night then all of this wouldn’t be an issue, but she doesn’t. On school days i have only a few hours to get her home fed and to bed and this has to also include an hours ‘quiet time’, so there’s not much time left for fun or excitement. I decided last week that i’d tried all i could and it was time to let the professionals help her. We had a doctor’s appointment this morning. After explaining all of the above to the doctor in an almost begging for help kind of way, he replied ‘im not sure how else you could handle this either? !’ my heart sank! I know in my heart that drugs are not the answer but i really had hoped he’d prescribe her something to help her sleep even if only for the short-term. I can’t bare to see her struggle so much. Instead, the only hope he could offer me was that CAMHS or the Community pediatrician (both of whom she’s been refered to, and is awaiting appointments which could be months) might be able to offer some more advice. I could have cried right there in his surgery. Seems all i have to cling to for hope in the interim is lavender, in the wake of todays appointment a few of my friends have suggested it. Im not sure that will help, if it was a wonder drug it’d be expensive surely, but im willing to try anything, it certainly can’t do any harm. I might try some myself, im starting to lose sleep with worry, well that and the noise from the next room as she tosses and turns all night. I’ve learnt that there are some things I just can’t give my girls no matter how much I want to! I grew up showered in love, it came from every angle and not just from home, there were grandparents to cuddle, auntie’s that spent time with me, uncles I admired and who treated me, cousins a plenty to play with, there was never a moment I didn’t feel loved! Many of those same people from my childhood are still in my life now and still manage to make me feel warm inside, and now they too shower my girls with love from afar by keeping them in their thoughts and hearts, my girls enjoy spending time with them all. We wanted the same for our girls, we wanted them to always feel safe and loved by a big family. We wanted them to know they were always in someone’s thoughts and heart. We wanted them to never feel like they’d ever be forgotten or didn’t matter. We wanted them to always have someone to turn to. They all said they’d be there for our girls, they all made us believe they deserved that special title they were given. We used to believe our girls would grow up in a big loving family. There’s a very small few that kept their promise, they shower the girls with love and affection, they keep them in their thoughts and hearts and consider them when making decisions. They love them entirely and treat them equally. For our girls, this is enough, they are happy and loved so much by our little family, they know no different. For me and my husband, this is disappointing, because we do know different. We know they don’t deserve those special titles they hold. For them, they’re missing out on so much. Our girls are growing and changing with every passing day. They are full of love and would happily of shared their hearts with them if only they’d given them their time. 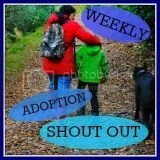 10 Things I’ve learnt since becoming an adoptive parent! 1. Sometimes Its the Not knowing that makes things so hard. Therapy can help our children to open up a little but theres a chance we may never get to know everything. It can be so hard not understanding your chilld, their fears, thoughts, worries, likes/dislikes or even just the things that make them happy. A child with an attachment issue may never let you in. 2. The internet is a blessing. Its the only real way to connect with people with similar experiences, get advice and be able to research. Librarys seldom store adoption related books. And ‘attachment’ is a foreign word outside the adoption network. 3. Connecting to the Adoption community is difficult. It is vital to find people who know what you are going through, can understand your feelings, fears and hopes. Yet, sometimes this can be so difficult. People dont generally have a sign on their head that announces that they adopted their children and support groups are few and far between. 4. Holidays and special events can be difficult. Birthday parties can be stressful for our children and for us. Being the centre of attention can be very overwhelming for our children. They may not cope well with the change in routine or the lack of structure a party brings. Then there is actually having to observe other children alongside your children, so their delays and social difficulties are sometimes very obvious. People naturally want to know what to buy your child, or what they enjoy doing. And you might not know. They might not play with toys, they might not know how. Ditto for Christmas. 5. Well-intentioned people will add to your frustration. They don’t mean to, but it is human nature to comfort and soothe. Invariably, they will attempt to do so in awful ways. Some will deny there is a problem and say that everything will be just fine . Some will even compare your children to theirs. By denying there is even a problem, they effectively silence you and leave you isolated in your own mind. Some will try to remind you how grateful you should feel, it could be worse afterall. And, while gratitude is a great thing, being reminded that you aren’t just makes you feel worse. 6. People will surprise you. Causal acquaintances will step up to be better friends than the friends and family you believed you could count on. There is nothing like becoming an adoptive parent to give one clarity. 7. Doctors and other experts really don’t know everything. Your pediatrician and other proffessionals may not see what you are so worried about and may try to convince you nothing is wrong. They may encourage you to wait and see. You will want to believe them and may forget that childhood trauma and attachment really isn’t their speciality. 8. If you aren’t a naturally assertive person, you will have to become one. People ranging from loved ones to the school system will fight you all the way about how best to meet your child’s needs. You will have to fight and ultimately insist — which is both harder and easier than you might expect. 9. It’s easy to neglect others when you are caught up with the needs your child. You can forget the importance of date night with your spouse. You might forget a friend or loved one’s birthday. You might realise you are not taking care of yourself and are about to fall apart. You will have to figure out a way to stay both connected and together. This is hardest thing to learn to do. 10. You will develop an appreciation for the little things. There are moments of interaction and progress that will steal your heart. Hugs and kisses might not be something your child feels safe enough to give often, so they are unbelievably precious when they do. Its that time of year, the season of fun and cheer! Or as it is in our family, its the season of anxiety, over stimulation, memories, uncertainty, worry and change with under tones of excitement, happiness and fun.